The Critically Endangered Ricord’s Iguana and the Vulnerable Rhinoceros Iguana can once again thrive on Cabritos Island, Dominican Republic after the successful removal of a suite of invasive species. Today, the island is filled with juvenile iguanas scurrying about, a sight rarely seen when invasive species were present. Native vegetation is also thriving. Now, Cabritos Island is the only place on Earth where the Critically Endangered Ricord’s Iguana can roam free from the threat of feral cats, donkeys and cows. These threatened iguanas survive as four populations, with three in the Southwest of the Dominican Republic and one in Haiti. The Ricord’s Iguana and Rhinoceros Iguana are the only two rock iguanas that overlap in their natural range. Both species are declining in the Caribbean due to invasive species and habitat loss. For years, invasive species, including feral cats and donkeys, on Cabritos Island threatened iguana populations by eating young iguanas, destroying nests, competing for food, and damaging critical habitat. The restoration of Cabritos Island in the Dominican Republic is an ideal model for effective conservation projects in the Caribbean. Supported by strong alliances at local, regional and international levels, this project has generated great conservation results that will generate significant benefits for endemic and native species in the years to come. The local technical capacity has been strengthened and focused on the National Strategy for the Conservation and Sustainable Uses of Biodiversity and its Action Plan 2011-2020 prepared by the Ministry of Environment and Natural Resources of the Dominican Republic, which is aligned with the goals of Aichi. This project featured an excellent team of biologists and assistants, who are mostly from the rural communities of our country. By integrating with a trained team, we built capacity to restore islands in the Caribbean, thanks to Island Conservation. We also want thank our national and international donors without whom many of these efforts would not have been possible, including the U.S. Fish and Wildlife Service, United Nations Small Grants Program, Van Tienhoven Foundation, and the Iguana Foundation. This project was logistically challenging and complex. Cabritos Island is approximately seven miles long (11.3 km) and one mile wide (1.6 km) and the camp is located at the west end. The team had to walk several miles each day or use a boat, which is extremely difficult when lake conditions are rough. To get around efficiently, the team disassembled an All-Terrain Vehicle (ATV) and transported the parts by small boats to Cabritos Island, where it was re-assembled. This was no small feat. With the eradication of these invasive mammals, one of the most important negative impacts for natural biodiversity is removed, significantly reversing the environmental degradation initially observed on the island. It is motivating to observe the increase in the number of sightings of juvenile iguanas and other reptiles, such as smaller size lizards and snakes (first time recorded during the project), as well as the regeneration of vegetation cover that was affected by large herbivores. With adequate and strict compliance with biosafety protocols and measures, the survival of native species is guaranteed in the long term. Ortiz also noted that the project results represent an invaluable precedent in the ecological restoration of islands at the local level, an admirable contribution that needs to be replicated in other islands of the country to continue to restore and preserve the biodiversity of Hispaniola. New research reveals that nearly half the Earth’s highly threatened vertebrates live on islands and are endangered by invasive species. By removing or controlling invasive species on these islands, we can protect 41% of all threatened vertebrates worldwide and 95% of threatened island species. Once introduced to islands, invasive mammals represent key threats to native species through predation, competition and habitat loss. Invasive species are implicated in 86% of all island plant and vertebrate extinctions. The removal of invasive species from island ecosystems is a proven way to protect biodiversity and prevent extinctions. There have been nearly 900 successful invasive species removal projects on islands across the globe. Staff from the Ministry of Environment and Natural Resources, staff and board of SOH Conservación and staff from Island Conservation join Minister of the Environment and Natural Resources Francisco Javier Tadeo Domínguez Brito. Funding for this project has been generously provided by the Global Environment Facility/Centre for Agriculture and Biosciences International, International Iguana Foundation, the Dominican Republic’s Ministry of the Environment and Natural Resources, Wallace Research Foundation, Van Teinhoven Foundation, US Fish and Wildlife Service Wildlife Without Borders, United Nations Development Programme Small Grants Program, anonymous donors, and the many conservationists who supported the project via the Cabritos Island Restoration Project online campaign. About Cabritos Island: Cabritos Island is a bit of a rarity, as it is an island within an island located in Lake Enriquillo, the largest lake and the lowest point of elevation in the Caribbean. The lake is in a valley between two high mountains created by the collision of two paleo islands that formerly constituted what is now Hispaniola Island. In fact, Cabritos Island is below sea level. This island and Lake Enriquillo constitute the Lake Enriquillo National Park, and Cabritos Island is the conservation core of the Jaragua-Bahoruco-Enriquillo Reserve of UNESCO; it is also part of the Massif de la Selle Corridor. About the partners: The Ministry of Environment and Natural Resources is the agency responsible for designing, executing and overseeing national policy on environment and natural resources, and promoting and stimulating activities of preservation, protection, restoration and sustainable use. 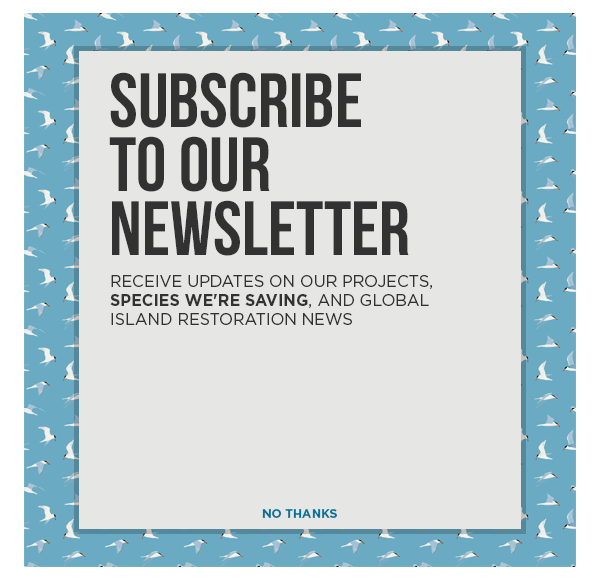 Island Conservation is our world’s only global, not-for-profit conservation organization whose mission is to prevent extinctions by removing invasive species from islands. We work where the concentration of both biodiversity and species extinction is greatest – islands. Removing a primary threat – introduced invasive vertebrates – is one of the most critical interventions for saving threatened plants and animals and restoring island ecosystems. Once invasive species are removed, native island species and ecosystems recover with little additional intervention. Since 1994, Island Conservation and partners have deployed teams to protect 994 populations of 389 species on 66 islands. IC is headquartered in Santa Cruz, CA with field offices in Australia, the Bahamas, British Columbia, Chile, Ecuador, Hawaii, New Zealand, Palau, and Puerto Rico. SOH Conservación is a non-profit environmental organization dedicated to the conservation of endangered species and their habitats on the island of Hispaniola. Our mission is to create knowledge, value, respect, and protection for the conservation of the biodiversity of our island, through research, education, training and the strengthening of Protected Areas.